This week’s PhotoFriday challenge was “Portrait”. I have a few self-portraits I’ve done that I’m especially proud of, but alas, I’m not really feeling like sharing them w/ the world just yet. I will someday though. So, I was looking through what I can post for y’all from what I’ve already taken that is not of a person. 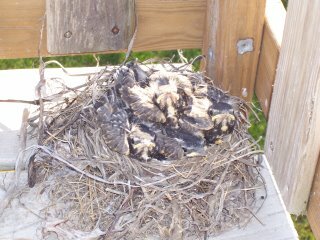 Last May (2005), my nephews found a birds’ nest in their jungle gym thingie. They were so concerned about these baby chickies, & checked up on them daily. When I talked to them on the phone, I heard all about them. 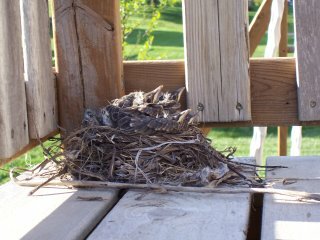 Then, when I went to visit them, of course I was led outside to see the babies. I love how they’re all just reaching up & above towards the sky. 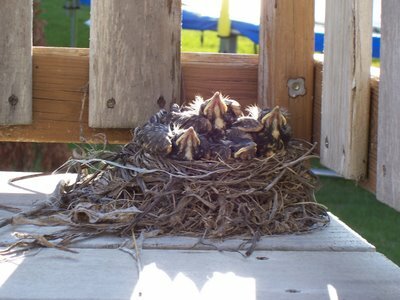 They’re all stretched & waiting for nourishment. Here’s a couple other shots of the babies. The 1st is a profile & the 2nd is looking down on them from above. You can click on either to enlarge, of course. *I say ‘real photo’ b/c I did post a pic of me in that profile thingie, but it’s only like a third of my face, so I’m still partially hidden. And click here to see other PhotoFriday pics.